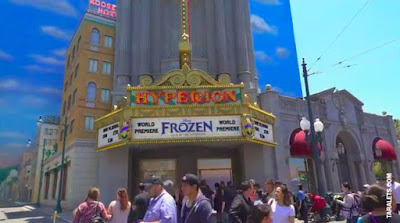 Highlights of the new "Frozen - Live at the Hyperion" musical stage show at Disney California Adventure that replaced the Aladdin musical. Video filmed on Opening Day 5/27/2016 at the 2:55 PM showing. "Delight in the magic of Frozen like never before in an all-new, larger-than-life stage production. The dazzling theatrical interpretation of Disney's global film phenomenon Frozen makes its debut at the Hyperion Theater at Disney California Adventure Park! Frozen – Live at the Hyperion brings Anna, Elsa, Kristoff, Sven and everyone's favorite snowman Olaf to life on stage. The show stays true to the poignant journey of Anna and Elsa, while also presenting a unique take on the tale through elaborate costumes and sets, stunning special effects and show-stopping production numbers. It's truly an unforgettable theatrical experience that will captivate the entire family. Frozen will play its out-of-town tryout at the Buell Theatre in the Denver Center for the Performing Arts in August 2017. As previously announced, Frozen features music and lyrics by creators of the film score Kristen Anderson-Lopez (In Transit, Up Here) and Robert Lopez (Avenue Q, The Book of Mormon, Up Here) and a book by Jennifer Lee (Wreck-It Ralph), the film’s screenwriter and director (with Chris Buck). Frozen won 2014 Oscars® for Best Song (“Let It Go”) and Best Animated Feature. Golden Globe Award and Obie winner and two-time Tony Award® nominee Alex Timbers (Peter and the Starcatcher, Here Lies Love, Amazon’s Mozart in the Jungle) is Frozen’s director. supervisor and creates vocal and incidental arrangements. Frozen is produced by Disney Theatrical Productions, under the direction of Thomas Schumacher. Watch out FrozenTheMusical.com for more upcoming details.